In 80% of tinnitus cases, tinnitus is a symptom of hearing loss, particularly noise-induced hearing loss. Prolonged exposure to loud noises can damage the structures of the inner ear and lead to tinnitus. You may have tinnitus following attending a loud event or exposure to loud sounds. The tinnitus is a signal from your brain indicating that the loud noise has done some damage to your ears. This is temporary, but extended exposure to loud sounds can result in permanent tinnitus or hearing loss. It is important to wear hearing protection when exposed to loud noises i.e. concerts, gunfire, power tools. It doesn’t matter what kind of noise it is, loud noises damage ears. Tinnitus may be a symptom of hearing loss. Your brain is signaling that your hearing is not normal. 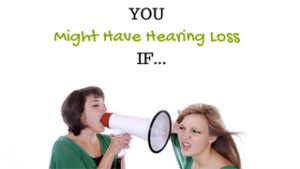 When you have a hearing loss, the stimulation reaching your ears is reduced. The tinnitus tries to make up for this lack of stimulation by producing a noise of its own. Some medications can cause tinnitus. These are called ototoxic medications which means they affect the ears. Some ototoxic medications can also affect your hearing. Aspirin is one of the most used medications that can cause tinnitus. If you begin experiencing tinnitus after a change in medication it may be a side effect of that particular medication. Simply stopping this medication may reduce the tinnitus. In some more rare cases, tinnitus may be a signal that medical attention is needed. An acoustic neuroma is a benign tumor on the hearing nerve. Sometimes tinnitus can be the first symptom of this tumor. This will most likely occur to one ear only (unilateral tinnitus). Tinnitus may also be a symptom of Meniere’s Disease which is a disease of the inner ear. This occurs in one ear and is accompanied by a feeling of pressure in the ear, fluctuating hearing loss, and dizziness. Tinnitus is connected to the limbic system which is the brain’s emotional center. Because of this tinnitus can cause worry. In turn, tinnitus may be more noticeable when you are stressed, fatigued, or anxious.